We've been thinking about moving apartments for over a year now. We've looked a few times, but never found anything that we fell in love with or felt like would be a good move...so back in June we decided to stay put and figure out how to make our small space work. Fast forward 3 months and we get a call from some of our best friends in the city, "We think you guys should check out this apartment..."
our friends had to move out of their apartment because their landlords decided they wanted to renovate their place so they needed to be out...in one month (crazy, out-of-no-where, NYC livin'..ugh.). They searched like crazy & found a great place on the 6th floor (praise the Lord for elevators) in a building that had another apartment open on the 1st floor. We checked it out & fell in love. It's a smart move for us and in so many ways feel like the Lord made all of this possible. We really did nothing to find this place! So thankful God is in control and made something beautiful (2 families getting new homes) out of a pretty crappy situation. I was beyond angry for our friends when they were being asked to leave their home and prayed, "God, WHY are you doing this?! It feels so unfair & wrong." God is so patient & kind with me...as I now pray, "Lord, THANK YOU! Your plan is so much better than mine...please help me to see that in every situation. Help me to trust you more." We are SO excited about living in the same building as our friends! It's going to feel like college all over again. ah! So before we can settle into our new place, we have to pack. Packing can be a stressful task--especially when you have less than 2 weeks to make it all happen. Thankfully, I love organization & structure so I'm in my element creating a packing plan and executing it! 1. Get rid of stuff! Thankfully having a small apartment *usually* means less stuff...Matt and I are not fans of clutter so if we don't use something/love it then it usually is given away pretty quickly & frequently. Even with our frequent purging, we still needed to go through all our stuff and make a 'give away' pile. We had a lot of stuff to give away! 2. Make a moving plan. I found this to work best for us. 3. Order Bin It. Seriously. Bin It made packing & moving SO easy! 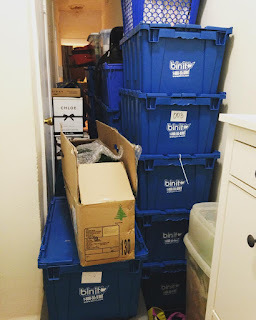 They brought the bins right to our old apartment I packed all of them up (no tape, no cardboard, no awkwardly shaped boxes...so easy!) and stacked them on top of each other (when you're in a small living space being able to stack the bins safely on top of each other makes a serious difference. it saved so much room!). They'll come pick them up at your new place when you're all unpacked too! This made packing a breeeeze! 4. Change your address (along with everything else...cable, utilities, bank, zipcar, etc.). When you're all moved in you'll have a LOT of unpacking to do, so it's nice to already have this done beforehand. 5. If at all possible clean your new apartment before you move in. It's so much easier to clean an empty apartment! & it makes moving in so much easier. 6. Ask for help, make it fun, & buy your friends lunch. We are so thankful for ALL the help we had to move. From people carrying (heavy...) boxes, to taking Hazel's crib apart so it would fit through the door (& putting it back together in our new place...! ), to holding our baby pretty much the whole day, to helping us clean our old place before we left. THANK YOU! 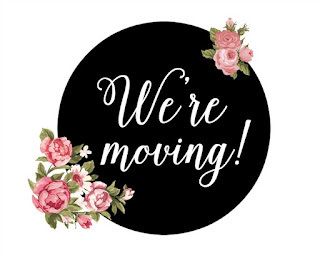 We couldn't have done the move without you, friends. I wish I had taken more pictures...it all happened so fast! Not that I'm planning on moving annnnytime soon, but I'd love to hear some of your moving tips! I'll post some pictures of our new place soon!